Mexican artist Frida Kahlo’s extraordinary life and iconic biographical paintings have earned her international renown in the world of modern art. 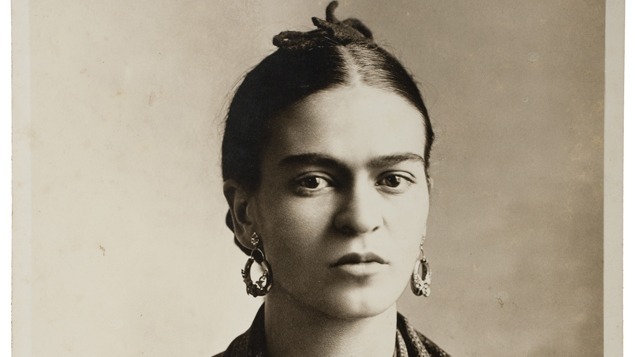 Upon Kahlo’s death in 1954, more than 6,500 personal photographs and items belonging to her and husband/artist Diego Rivera were sealed and put in storage. For more than half a century this great collection of personal memorabilia remained hidden from the public. In 2007 this collection was opened and Mexican photographer and curator Pablo Ortiz Monasterio inventoried and catalogued 240 images to create the Frida Kahlo: Her Photos exhibition. These images reveal a little-known side of the artist and lifelong resident of Coyoacán, a Mexico City suburb and Arlington, Virginia’s sister city. The collection of photographs in this exhibition reflect Kahlo’s tastes and interests, the experiences she shared with those close to her, and her complicated, but also thrilling, personal life. Viewers get an insider’s look, not only through who was behind the camera, in front of the lens or the anonymous nature of some of the work but also through the annotated writing found on the back of many of the photographs. From family pictures and snapshots taken with lovers, to images that reveal relationships with Russian Marxist revolutionary Leon Trotsky and American photographers Edward Weston, Alfred Stieglitz, artist Georgia O’Keefe and actress Dolores del Rio, this exhibition provides a glimpse into Kahlo as never seen before. This exhibition was organized by the Frida Kahlo and Diego Rivera Museums. Its worldwide tour is managed by Terra Esplêndida.